For those that follow me, know I love wardrobe essentials from the basic white t-shirts and shirts to a black dress, forever lasting in your wardrobe. If budget is no obstacle, go for quality. 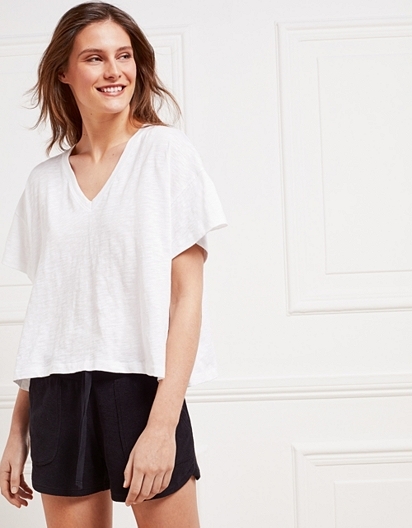 One store that does the basics to a tee is The White Company. The white company is known for there clean neutral colours and timeless styles, not only in their home range but in fashion too. As summer is well and truly here, I have picked out a few of my favourite pieces from their range, mainly the summer essentials. 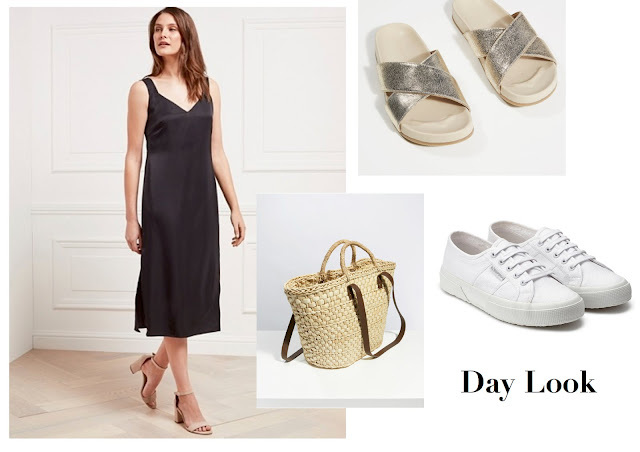 First up is the grey linen wrap dress, which I'm wearing with the black espadrille sandals. The sandals give a little height and will go well with jeans too. This dress is light, breathable and just right for me, as I'm 5 months pregnant. I think it will go perfectly with white trainers or even heels for an evening out. A black dress is essential in anyone's wardrobe. I have styled this in a daytime and evening look below. This dress would last all year round and would be great for winter too teamed up with a chunky cardigan and lace-up ankle boots. Another alternative black dress I like is the below linen wrap dress (same as the grey version I'm wearing), perfect if you want to show off your legs and very roomy if you want something loose fitting. Team with trainers or the below gold sandals. The summer skirt! I absolutely adore this skirt (comes in black too), elasticated waist, midi length and linen. Team with trainers and a white t-shirt for a classic day look, or pair with these espadrilles. Come transitional season wear with a light jumper or pair with a leather jacket. If you fancy buying any of the above items mentioned or others, I have a special code for all my readers. The offer is an introductory 15% off orders plus free delivery over £50 (online & In-store), just use the code TEECLUTTER15 (Valid from 18th May 2018 till 19th June 2018). Please see below terms and conditions. Happy Shopping!!! (T&C’s: Offer is valid on full-priced items only and cannot be used in conjunction with any other offer. Standard free UK delivery is valid for online, telephone and store mail orders to the UK mainland only when you spend £50 or more. Offer excludes gift wrap, gift vouchers, all furniture, beds, mattresses, upholstery and made-to-order items. Offer is not valid in our clearance stores. Valid while stocks last. For full Terms & Conditions please visitwww.thewhitecompany.com/help/terms/. To redeem this offer in-store you must present this code or show it on your mobile device. Offer ends midnight 19th June 2018). This post was in collaboration with 'The White Company', however, all words are opinions and words are my own.